The three Bulgarian women surround their victim as they attempt to dip their hands into a handbag in London’s famous shopping district. Sergeant Steve Stamp then shouts at the camera: ‘They’re doing it, they’re doing it!’ as he moves in and arrests the gang. The shocking footage will be aired on a Channel 5 documentary called Inside Oxford Street tonight. 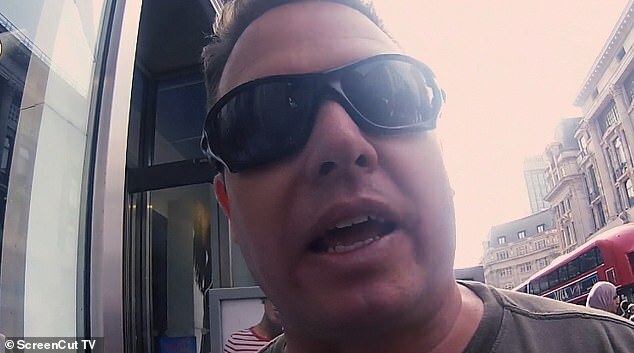 Sergeant Stamp, who patrols the area and targeting shoplifters and pickpockets, added: ‘They have gone for that first lady there, tried to take something from her. ‘She spotted them so they’re on it. They then move from her, they follow this lady here, straight away they are working up close. ‘She’s gone for the purse, tried to open it up before she has turned around and realised. ‘Then she’s clocked us, so we have had to go in for the kill. Sgt Stamp added: ‘Everyone knows when they come to London, they are going to go shopping on Oxford Street and all the pickpockets know that is where the’r prey is going to be. 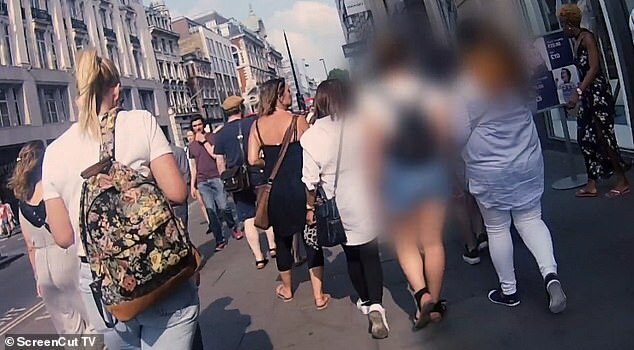 Shocking footage shows the youngsters targeting wealthy shoppers along Oxford Street. Each child is accompanied by two or three adult women who walk slowly behind, watching for police, security guards and other potential targets. Watching the begging gang as they approach Selfridges, one of the department store’s doormen, who asked not to be named, said: ‘They are around here every day and they are now so brazen. ‘We’ve nicknamed them ‘hugger muggers’ because they come out of nowhere, start hugging someone and won’t let go until they hand over some cash. A spokesman said: ‘In order to deter criminality, officers in Westminster deploy a number of tactics including high-visibility patrols as well as plain-clothes operations, whilst offering crime prevention advice to residents, visitors and local businesses. Inside Oxford Street is on Channel 5, tonight, 9pm.